Primo Levi has long been admired for his harrowing account of suffering in Auschwitz, If This Is a Man. Among the thousands of survivors who have written about their experiences, Levi's work stands out for its understanding of the human condition and philosophical exploration of the polarities of good and evil. 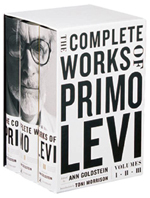 The Complete Works of Primo Levi presents all-new translations of the life's work of "one of the most important and gifted writers of our time" (Italo Calvino). These fourteen books in three volumes will bear testament not only to a brave holocaust survivor but to a universally relevant twentieth-century author. Highlights of the collection besides If This Is a Man include: The Periodic Table, one of the most acclaimed memoirs of the last half century where in each of the 21 stories Levi connects some aspect of his life in pre- and post-war Italy to an element from the periodic table; The Drowned and The Saved, his most philosophical work; and Levi's essays and other non-fiction work never before published in English. Primo Levi was an Italian Chemist who was arrested during the Second World War as a member of the anti-Fascist resistance and deported to Auschwitz in 1944. He died prematurely in Turin in April 1987. Ann Goldstein is an editor at The New Yorker and a recipient of a PEN Renato Poggioli translation award and a Guggenheim Fellowship. Toni Morrison is a Nobel Laureate and the acclaimed author of Beloved.